Our bus drivers are responsible for ensuring that each student arrives to school safely and on time. Drivers hold a commercial driver’s license and undergo rigorous training and professional development on an ongoing basis. They obey all state and local traffic laws at all times. Please review our district transportation rules with your child. 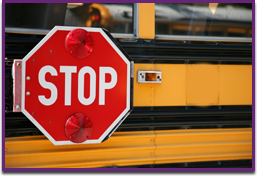 Bus transportation is a privilege, and Wilmington CUSD reserves the right to revoke that privilege if a student is a safety hazard to themselves or others. Students should walk to the bus stop in a safe area, such as a sidewalk. Students should arrive at the bus stop five minutes prior to the bus arrival. Students should wait for the bus in a safe area, such as on the sidewalk. Refrain from horseplay. Students must enter and exit the bus in an orderly manner as directed by the bus driver. The bus driver may assign seats as needed. Students must remain seated when the bus is in motion.